Microsoft Research is happy to continue hosting this series of Image Recognition (Retrieval) Grand Challenges. Do you have what it takes to build the best image recognition system? Enter these MSR Image Recognition Challenges to develop your image recognition system based on real world large scale data. New! We are hosting two new challenges at ICCV 2017: “Recognizing One Million Celebrities” and “Low-shot Learning”. New! Challenge Website is online, for details of datasets, metrics, schedule and latest updates, please visit MsCeleb.org. 6/21/2016: Evaluation results announced, details. 6/17/2016: Evaluation Finished, 14 teams finished the grand challenge! 6/13/2016: Dry run finished, 14 out of 19 teams passed, details. 6/10/2016: Dry run update 3: 8 teams passed, 11 teams ongoing, details. 6/9/2016: Dry run update 2: 7 teams passed, 11 teams ongoing, details. 6/8/2016: Dry run update 1: 5 teams finished, 13 teams ongoing, details. 6/7/2016: Dry run started, dev set are being sent to each recognizer, details. 6/3/2016: Update about the dry run started on June 7, details. 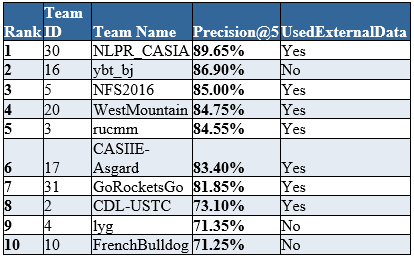 5/27/2016: SampleCode/GUIDs/TestTool are released to each team, details. 5/9/2016: Development dataset is released for download, to be used during dry-run. 5/9/2016: Competition/paper registration is opened here, Please provide your Team Name (as the paper title), Organization (as the paper abstract), Team Members and Contact information (as the paper authors). 4/29/2016: Entity list is released for download. 4/5/2016: Cropped and aligned faces are ready for download. 4/4/2016: More data are available to for downloading: samples. 4/1/2016: MS-Celeb-V1 ImageThumbnails ready for downloading. We have finished the MSR Image Recognition Challenge (IRC) @ IEEE ICME 2016. More details here. We just finished the evaluation! More details below. The dataset for this challenge is described here and can be downloaded here. Feb 23, 2016: Registration web site is opened, details. Feb 24, 2016: Update about data sets, and faq, details. Feb 26, 2016: Update about sample codes, and faq, details. March 3, 2016: Update about test tool, team keys, and faq, details. March 7~10, 2016: Dry run traffic sent to your system for testing/verification, and faq, details. March 10, 2016: Update about final evaluation and faq, details. April 3, 2016: Grand Challenge Paper and Data Submission, details. We have finished the challenge in ACM MM 2015. More details here. Dataset available for download (Clickture-Lite) and hard-disk delivery (Clickture-Full). June 18, 2015: Trial set available for download and test. June 28, 2015: Evaluation results announce. May 22, 2015: Pre-registration form available. June 18, 2015: Trial code samples for Task#2 is delivered by email. Contact us if you haven’t received it. June 19, 2015: Test tool for Task#2 is delivered by email. Contact us if you haven’t received it. June 24~June 25,2015: For task#2, dry run traffic will be sent to your recognition service,please keep your recognition service running! June 26, 2015: Password to decrypt Task#1 evaluation data is delivered to all participants by email on 0:00am PST, please let us know if you haven’t received it. April 21, 2015: Final evaluation set available for download. April 25, 2015: Evaluation end at 3:00AM PDT (very beginning of April 25). Result submission due. April 28, 2015: Evaluation results has been sent to corresponding teams. May 1, 2015: More details about the evaluation results are shared with participants. April 28, 2015: Evaluation result sent back to corresponding teams. April 23, 2015: Password to decode the evaluation set was delivered to all participants by email. Please contact us if you haven’t recevied it. April 21, 2015: Evaluation set available. April 17, 2015: Trial set is available for download (the same as ACM MM 2014). April 17, 2015: CMT Website is online. The grand challenge page at ACM Multimedia 2014. IRC @ MM 14 at this site. June 26, 2014: Due to many requests, the MM14 grand challenge submission deadline was extended for a week. So we also extend MSR-Bing challenge result submission deadline for one week. Please check the updated dates below. Register a “paper” entry. Make sure to finish this step ASAP (at the latest 30 minutes before the challenge starts). Password to decrypt the evaluation set will be set through CMT. Download the encrypted evaluation dataset. Please note the downloaded file was zipped twice (once with a password and once not). Unzip the downloaded file (without password) to make sure the file is not corrupted. Unzip the file you get from Step C with the password that will be sent to you through CMT. You will then get two files: one is a (key, image thumbnail) table, and the other is a (key, label) table. Please refer to this page know the details how to do generate prediction results. Before the end of the challenge, submit your prediction results (up to 6 zipped files – see instructions below). Submit your grand challenge paper according to the guideline in the ACM Multimedia 2014 website. Please note the CMT site is only for prediction results submission. Your paper should be submitted to EasyChair paper system. Make sure that you include your evaluation results in the paper (which will be sent to you before the paper submission deadline). June 25, 2014: Evaluation set will be available by EOD today. CMT will be also online at the same time. June 25, 2014: Evaluation starts and ends dates changed (1 day delay). June 19, 2014: Trial set is available. Feb 15, 2014: Dataset available for download (Clickture-Lite) and hard-disk delivery (Clickture-Full). June 18, 2014: Trail set available for download and test. July 5, 2014: Evaluation results announce. Q: Can I use ImageNet or other data for network pre-training? A: Yes, you can use pre-trained CNN models (by ImageNet or other dataset), as long as you can fine tune that well to fit for the dog breed categories. Basically, we treat these pre-trained CNN models as feature extraction layer. Your system/algorithm output will be evaluated and compared with other team’s results. But, if you use some data other than Clickture dataset as positive/negative examples during the training/tuning, please describe this clearly and notify us before the evaluation starts. Your algorithm/system will still be evaluated, we are considering to rank these systems in separate tracks for fairness. Q: We found there are some noise/conflicting labels in Clickure-Dog dataset. Is this expected? A: You may find that there are ~15K images appear in multiple dog breeds. The reason is as follows: we use the clicked queries as the “groundtruth” of dog breeds, but sometimes the same images are returned/clicked by multiple dog breed queries. We intentionally to NOT remove these 15K images from the data. Because we treat this as an important/interest topic to automatically remove the “wrong/conflicting” samples and keep the “correct” labels, during data collection and training. Q: How is the evaluation data set constructed? A: We extracted all the dog breeds that have matched names in pairs in Clickture Full, which result in 344 dog breeds in Clickture-Dog data set. The evaluation dataset will include 100 categories, including part of these 106 dog breeds which have more than 100 samples in Clickture-Dog dataset. But we will also include a few categories with small number (i.e. <100) of samples. This is to encourage participants to train a recognizer that can recognize as many as possible dog breeds. The Clickture-Dog is just one way to collect training data. You can also filter the Clickture-Full to find more data. This year, we also allow participants to collect training data outside of Clickture by themselves, but we will only control the evaluation set to define the problem. Q: How to extract the images and associating class labels from clickture_dog_thumb.tsv file? the first column (“affenpinscher”) is the dog breed label, If you count all the unique dog breed strings in the first column, there are 344 dog breeds in this Clickture-Dog dataset. the second column (“/LUkKqfrtLwqEw”) is the unique key for this record (which can be used to locate the corresponded record in the Clickture-Full dataset). the third column (“/9j/4AAQSkZJR…”) is the jpeg image encoded as base64, which can be saved to file by “File.WriteAllBytes (“Sample.jpg”, Convert.FromBase64String(ImageData))” in C#. You can also use this website to decode this base64Encoded image data and save it to a jpg file manually. Q: We are trying to run the sample server on our Linux machine and we are getting an Unhandled System.TypeLoadException? A: Please install FSharp first and give it a try again: “sudo apt-get install fsharp”. If it still doesn’t work, please run the program with: “MONO_LOG_LEVEL=debug mono [***the exe program***]” and send us all the output. Put a break point in the PredictionFunc(), to see whether your classifier wrapper (the sample code) really received the request, and which exe or function (which should be your classifier) it called to recognizer the image, here you may have put a wrong exe file path, or your classifier DLL may have some issue, or you forgot to build the IRC.SampleRecogCmdlineCSharp.exe, which the sample code will call by default to return dummy results. A: For Linux/Ubuntu users, please follow the instructions we provided in the readme file to install the up-to-date version of mono and fsharp. Please note that the sample code has to be run with the newest version of fsharp (4.3.1) . The default mono and fsharp packages you get from Ubuntu may not be up-to-date. Please follow the readme file provided with the sample codes to install the newest mono and fsharp package. If you have already install the old version, please do the following to fix the problem. Error: Connected to Prajna Hub Gateway vm-Hub.trafficManager.net, but get empty response, please check classifier 12345678-abcd-abcd-abcd-123456789abc and its response format. A: Some teams confused serviceGuid with providerGuid, so they used the providerGuid to hit a classifier in step#2, which should be serviceGuid instead. ServiceGuid is used to identify your classifier, while providerGuid is used to identify your team. Please use the exact command lines we sent you in earlier email of update 3/3. No need to change anything.